Chicken tortilla soup is one of my favorite soups of all time. As a matter of fact, sometimes I'll order it when we go out for Mexican because I love it so much. And though it's been a while since I've made it, this is my all-time favorite recipe. 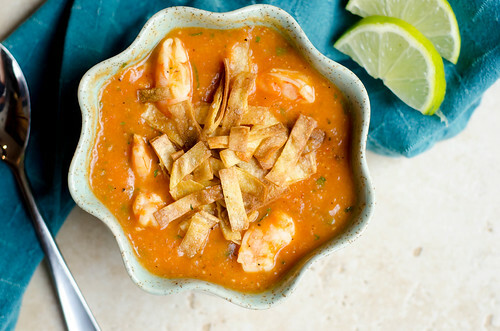 However, when I saw a recipe for shrimp tortilla soup, it stopped me in my tracks. How smart! I think shrimp and tomatoes go well together already, and the smoky, spicy soup that's finished with a good dose of lime juice just works. It somehow feels a little lighter than chicken tortilla soup, even topped with the crispy and crunchy tortilla strips. The base is made up of onions, chipotle chiles, tomatoes, and hominy. After simmering a bit, it's pureed and returned to the stovetop. There, the lime, cilantro, and shrimp are added. The shrimp cooks really quickly in the broth, and before you know it you're enjoying a big bowl of comfort. We've all been battling what feels like a never-ending cold, and this spicy soup was both comforting and restorative. I kept it simple and served it with cheese quesadillas - which coincidentally were great dipped into the broth. This soup is homey, it's comforting, it's healthy... pretty much the perfect combination. If you're into making soups ahead of time and freezing, I would just make the tomato-base, freeze, then add the shrimp to cook as you reheat the soup. Heat the oven to 435 degrees. Toss the tortilla strips with 1 tablespoon of oil and salt. Arrange in a single layer on a baking sheet and cook until deep-golden brown and crispy, 10-12 minutes, tossing halfway through. Season with additional salt and pepper to taste and transfer to a paper towel-lined plate. Meanwhile, heat the remaining tablespoon of oil in a large pot or dutch oven over medium-high heat. Add the onion and cook until softened, about 4 minutes. Add the garlic, cumin, chile powder, and chipotles. Stirring constantly, cook until fragrant, about 30 seconds. Add the broth, hominy, and tomatoes. Bring to a simmer, reduce heat to low, cover, and cook about 15 minutes to allow the flavors to meld. Working in batches, puree the soup in a blender or food processor until smooth. Return the soup to the pot and bring to a simmer. Add the shrimp and cook, stirring occasionally, until they are just cooked through and opaque, about 2-3 minutes. Remove from heat and stir in the cilantro and lime juice. Ladle into bowls and top with tortilla soups. Serve with lime wedges. I love the idea of this...shrimp in soup is under-recognized! It cooks so fast in all the warm flavors...yum! I can't wait to make this! I feel silly that I've never thought of this...my love for chicken tortilla soup blinded me to other options ;-) thanks for sharing..pinned so I remember to make! I've never seen shrimp in a soup PERIOD no less a tortilla soup! What a great idea! Yum! I don't know why I've never thought to swap out the chicken for shrimp. My husband would love this! Big Ish finally found a finish that was entirely out of keeping with his very poor performance with a sweet side foot past O'Brien from the edge of the box to restore his side's three goal lead with just five minutes left write my paper. Hastings fluffed an effort from a corner in added time that might have reduced it to two again. A Tour of My New Kitchen!